Hand Embroidery Supplies specialises in providing hand embroidery products and tuition to fellow embroiderers. We stock one of the largest, most diverse ranges of essential and beautiful hand embroidery products available and, in the unlikely event that we don’t have what you need, we’ll endeavour to source the item for you at no extra cost, regardless of where it comes from. Based in Queensland, Hand Embroidery Supplies was established to provide like-minded embroiderers with an all-encompassing range of threads, ribbons, charms, lace, buttons, beads, braids and more, so that all aspects of your embroidery projects are catered for. Hand Embroidery Supplies have sourced and accumulated some of the world’s finer embroidery items, along with every essential you could imagine. That way, no matter how intricate or complicated your envisaged project may be, we are sure to have whatever you need available from the start, under one roof. All items in our store are available for shipping worldwide, but if you wish to stop by, you are more than welcome to enjoy a cup of tea as you browse. 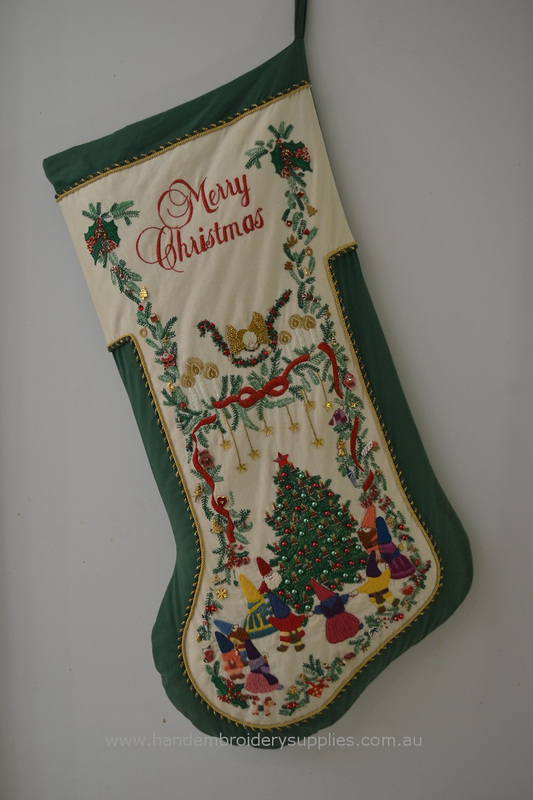 This Christmas Stocking project was embroidered by Frideh Bossner and won 1st Prize in its category and was also Overall Winner in the Embroidery Section at the first Beating Around The Bush, 2000.